Built from 1925-1928, the Princeton University Chapel is one of the most significant buildings on the Princeton University campus. Designed by noted gothic Revival architect Ralph Adams, Princeton's supervising architect form 1906 - 1929, this building is arguably one of the finest examples of the Collegiate gothic styles, and its construction truly transformed the Princeton campus. 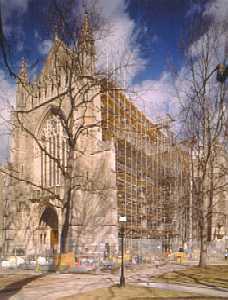 The masonry work included repointing all exterior stonework, the disassembly of limestone pinnacles; resetting existing pinnacles with stainless steal anchors; replacement of severely deteriorated limestone units with new units fabricated to match the original; and selective repairs of spalls, cracks and losses in limestone with Indiana limestone dutchmen, composite patches, and grouting. In order to take advantage of the scaffolding needed for the stone restoration, window restoration had to be completed within the same two year period. 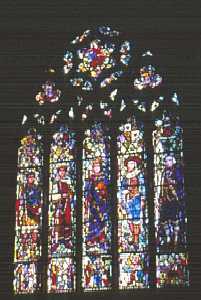 To meet the schedule, the stained glass restoration work was completed by a team of studios located in Philadelphia, Boston, Long Island and France. Each window panel was documented, then carefully removed from its limestone groove, and then crated and shipped to the studio. Following more documentation, each panel was then disassembled and cleaned. Broken pieces were repaired or replaced when the original glass could not be salvaged. The panels were then re-leaded, glazed with putty, burnished, then shipped back to the Chapel for reinstallation. The project also included the restoration of over 50 leaded, clear, diamond light windows. The project began in July of 1999 and was completed in December 2001. The restoration of the 28 stained glass windows of this magnitude in the limited span of two years may be the largest stained glass restoration program to be completed in the United States. The total cost of the project was $10 million dollars, of this $2M was devoted to scaffolding, $4 M to masonry and $4 million to stained glass. 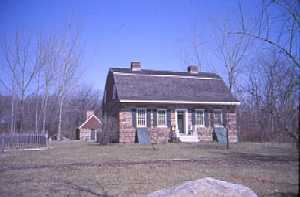 The project utilized a $750,000 grant from the NJ Historic Trust. Stained Glass Studios: Art of Glass, Media PA; Serpentino, Needham MA; Studio Restorations, East Marion, NY; and DePirey International, Allouis, France. 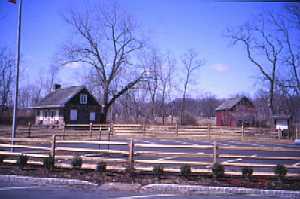 In 1995, the Historic New Bridge Landing Park Commission was established by the New Jersey Legislature to coordinate and implement governmental and private development policies and other activities incidental to the preservation maintenance, restoration and interpretation of the historic riverfront village surrounding New Bridge, thereby optimizing its educational and recreational benefit to the public. Soon thereafter, a General Management Plan was prepared, setting forth the interpretive themes, management objectives and future planning needs. The historic village spans the Hackensack River at the intersection of four municipalities (River Edge, New Milford, Teaneck and Hackensack) and encompasses municipal, county and state owned resources. Representatives from each government entity as well as from the Bergen County Historical Society and the Blauvelt-Demarest Foundation serve on the Commission. The Commission has successuflly combined money, expertise, from a multitude of public and private sources to leverage restoration, land acquisition, and site enhancement and has in a very short time shown itself to be a model for success. Since 1995, the Steuben House, owned by the State, has been transformed by a new heating system, roof replacement, carpentry repairs, and exterior restoration supported by archaeological investigation and historical research. The site has been enhanced with new parking facilities, removal of inappropriate vegetation and new landscaping. New Milford is working on a streetscape plan for the property along French Creek and through Bergen County's efforts, the little swing bridge is about to be restored and an addition is being planned for the Campbell-Christie house. Two years ago the Steuben House and Historic New Bridge Landing were listed on Preservation New Jersey's Ten Most Endangered Sites. Through the coordinated efforts of the Park Commission, the Division of Parks and Forestry, the County of Bergen, Senator Robert Torricelli who is responsible for securing $1.1 M in a special federal appropriation, Assemblywoman Loretta Weinberg, Congressman Steve Rothman, NJ Assemblywoman Charlotte Vanderwalk, NJ Senator Gerry Cardinale, and many, many others, this Revolutionary War site has become a proud landmark of the early settlement of northeastern New Jersey and of the Revolutionary War. Initiative Partners: River Edge Borough; New Milford Borough; Teaneck Township; Bergen County; New Jersey Department of Environmental Protection, Division of Parks and Forestry; Bergen County Historical Society; and Blauvelt-Demarest Foundation. Recognized For Creation of the New Bridge Landing Park Commission: Robert Griffin, Timothy Adriance, James L. Bellis, R. Lynden Day, Mary Donohue, S. Frederic Guggenheim, Sandra Loft, Ruth Van Wagoner, Anne Subrizi, Deborah Fisk, Todd Braisted, Sue Jenkins, Pat Shuber and Adam Strobel of Bergen County, Mark Pitchell, Kevin Wright, and former Division of Parks and Forestry Director, Greg Marshall. Plainfield City Hall was designed by Peck & Bottomley in 1917 in the Georgian Revival style and exhibits many of the classically inspired features used in the design of municipal government buildings of this period. The cupola was constructed entirely from terra cotta and had suffered from inappropriate maintenance over the years. While repairs to the building were initiated in 1992, funding limitations postponed the needed cupola work. In 1973, the twelve columns, the dome, lantern, and the interior drum were sealed and coated with a rubberized cloth glued onto the cracked and spalled terra-cotta. The cloth was then coated with a proprietary two-part acrylic sealant containing large embedded particles to simulate the appearance of limestone. Imperceptible at a distance, this layered coating looked simply dirty; but up close, this material could not have looked more different than the smooth and glossy surface of the original off-white terra-cotta. The columns themselves had blistered beneath the surface and imbedded ferrous anchors and dowels had melted away. 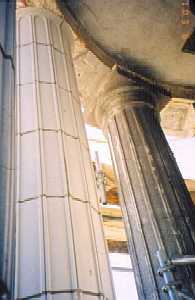 The interior of the columns themselves, which were noted on the drawings to contain continuous steel supports were actually constructed of clinker fill and ash. 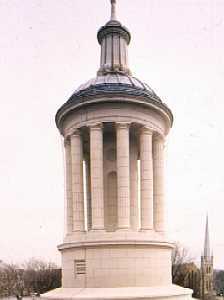 The base of the dome, also believed to contain a metal armature, was cantilevered from the central drum and rested on the top of the fourteen foot fluted columns. Seven hundred ten (710) new replacement units were fabricated to replace the broken column sections and the lanterns. Terra cotta was replicated. The dome was patched and prepared to receive a new lead coated copper roof that would replicate the segmental panels of the original terra-cotta surface. Lastly, lightning protection and bird proofing were installed to mitigate storm and reduce the corrosive effects of roosting birds. This project would never have been realized were it not for the determination of the City's administration to restore what is for Plainfield an emblem of their democracy and serves as a symbol for their municipal seal. The total project cost was $630,000 and partial funding was provided by the NJ Historic Trust. T & M Associates, City Engineers; Page Ayres Cowley Architects, LLC, Restoration Architect; ; Culbertson Restoration, Ltd., Contractor; Boston Valley Terra Cotta; and Schtiller & Plevy, Metal Roofing. In Somerset County, not only does this year's award recognize the fabulous restoration of the Somerset County Courthouse, Lord Memorial Fountain, and courthouse grounds, but it also highlights the County's integration of historic preservation goals into their planning efforts. Somerset was the first County to develop a substantive and comprehensive re-grant program for bricks and mortar restoration, from their open space and farmland preservation funding. Other counties are following their example. Somerset County Board of Chosen Freeholders; Ford Farewell Mills and Gatsch, Architects; Hall Construction, Contractor (Courthouse Restoration); Fountain Restoration: Building Conservation Association, Materials consultant; Princeton Engineering Group, Mechanical & electrical engineering; AMM Technical, Plumbing; Paragon Restoration, Contractor. 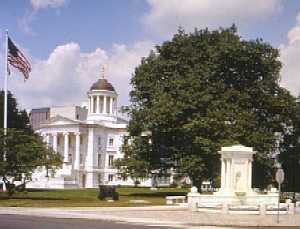 The Somerset County courthouse was built between 1907 and 1909. Designed by noted architect James Reily Gordon, a Texan, who's portfolio includes the Texas Pavilion at the World's Columbian Exposition, the Bergen County Courthouse and the Arizona Capital. 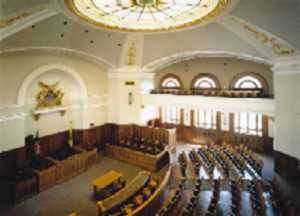 Most famous as the site for the famous 1927 Halls-Mill murder trial, the rehabilitation of the courthouse was completed in 1996 and much of the work involved careful integration of modern day technology and accessibility needs into an historic space while respecting the historic finishes. Exterior work included the repair of the main stairs, window repair, structural bracing of the parapet and a new standing seam, terne-coated stainless steel roof. The John Haynes Lord Memorial Fountain was built in 1910 as a monument to John Haynes Lord by his sister Alliene Lord. 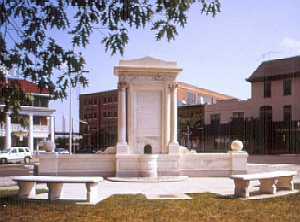 Lord was President of the Second National Bank of Somerville and a prominent town citizen. His sister requested in her will that a drinking fountain be erected for "man and beast" in memory of her brother. The fountain was designed by John Russell Pope, who also designed such prominent Washington buildings and monuments as the Jefferson Memorial, National Archives Building and the National Gallery of Art, just to name a few. Having fallen into deteriorated condition and no longer functioning, the County wanted to see this monument once again serve as a drinking fountain. Innovative solutions were needed to remove the existing plumbing and install new plumbing while leaving the exterior envelope of the structure intact. Exterior stone was cleaned and repaired, and the lion's face on the basin side received a newly carved stone dutchman to replace the portion of his face that had been broken during an attempt to remove one of the original pipes. According to old newspapers, the drinking fountain had a bronze lion head plaque that was an exact duplication of the stone lion on the trough side. This missing plaque had to be recreated by a bronze sculptor using the broken stone lion head as a model. Bronze chains were reinstalled between the granite bollards to replicate the original chains. The marble benches behind the fountain were cleaned and reinstalled. The fountain restoration totaled $249,082 and took approximately one year to complete. This investment greatly enhanced the corner of the larger Courthouse Green and has revived community pride in downtown Somerville. Craftsman Farms is currently operated under the auspices of The Craftsman Farms Foundation and is open to the public. A 2002 historic preservation award was presented to Mark Alan Hewitt and the Syracuse University Press for Gustav Stickley's Craftsman Farms: The Quest for an Arts and Crafts Utopia, an insightful capturing of Stickley and the Arts and Crafts Utopian movement. 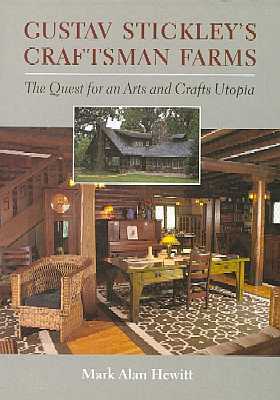 A National Historic Landmark, Craftsman Farms is located in Parsippany Troy-Hills, Morris County. It is the place where the ideals of Gustav Stickley came together, if only for a short period of time, to create a kind of "utopia" as a vehicle for social change. The book is a critical look at Stickley's philosophy and how these ideals manifested themselves at Craftsman Farms. Scholarly endeavors, such as this, enhance our appreciation for the time period and provide greater context from which to evaluate our past. Beverly Brandt's review in theJournal of the Society of Architectural Historians: "Hewitt weaves together biography with art history, material culture with literary themes, social history with the analysis of technology and craft. He does so skillfully in the four chapters that follow, and through it all, his professional architectural training is also subtly apparent in tone and approach." Mark Alan Hewitt is an architect who's practice in Bernardsville specializes in historic preservation projects. 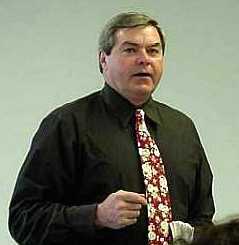 Mr. Hewitt is a graduate of Yale University and the University of Pennsylvania and was an NEH Winterthur Research Fellow. He has taught at New Jersey Institute of technology, Columbia University, University of Pennsylvania and is currently associated with the Certificate in Historic Preservation Program at Drew University. Prior works include The Architect and the American Country Home (1890-1940) and The Architecture of Mott B. Schmidt. The Higginsville Road Bridges are two through-truss bridges joined by a common island pier. Together these bridges form the crossing of the South Branch of the Raritan River. 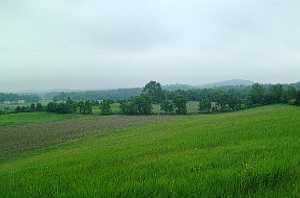 The area is predominantly rural and agricultural and the view both toward and from the bridges is quite picturesque. The truss bridges were built in the late nineteenth century and represent well-preserved examples of the "American Standard" bridge. Each bridge was deemed structurally deficient in load capacity, primarily due to original member sizes and deterioration of the floor beams and deck. For continued vehicular use, the bridges had to be strengthened. It was the goal of both Hunterdon and Somerset County to preserve these bridges and keep them in service. The Counties' final solution to strengthening the bridge allowed the original members to remain in place. Many of the existing deteriorated members were not replaced, but were considered as structurally non-contributing elements allowing the historic fabric to be retained. 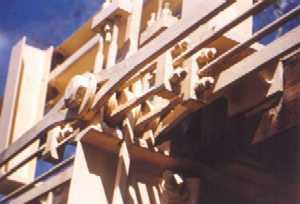 New supplemental structural members were used to strengthen the existing trusses rather than replacing or altering the historic members. The new supplemental members were specifically chosen not to replicate original members, but to be easily distinguishable from the original, yet not visibly obtrusive. Tie rods were chosen since they offer the least visual impact. Abutments and wingwalls were repaired. In the past decade, the general public has demonstrated a great fondness and attachment for its bridges. Eric Deloney, Chief of the American Historic Engineering Record, summarizes this affection very succinctly: "Old bridges may represent past technologies, yet they provide a connection with that vanishing past by softening its collision with the future." This project serves as a model collaborative effort. 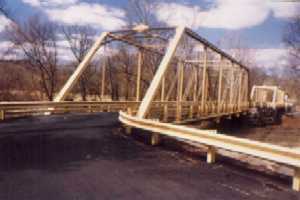 As single lane truss bridges, sources of funding to rehabilitate were limited. Both counties worked together to nominate the site to the New Jersey Register and secure a matching grant from the NJ Historic Trust. The total cost for this project came to $1,395,810 including a grant from the NJ Historic Trust of $588,750 and financial commitments from both Hunterdon and Somerset Counties in the amount of $403,530. Somerset County Board of Freeholders; Hunterdon County Board of Freeholders; Richard Groholski, John Glenn and James Martin, County Engineers; Keller & Kirkpatrick; Herb G. Githens, Architects & Planners; Mary Delaney Krugman Associates, Preservation Consultant; IEW Construction Group, General Contractor. With the building of the new Convention Center in Atlantic City, preservationists feared for the fate of the National Historic Landmark Convention Hall on the Boardwalk. Built in 1929, it is one of the last survivors of the early twentieth century Atlantic City silhouette. At the time of its dedication, it could seat every resident in Atlantic City. The decision by the New Jersey Sports and Exposition Authority to step in and create a new future for the building was a courageous one. From the architect's perspective: "the challenges were considerable. The Auditorium had a flat floor exhibition space 456 feet long and 310 feet wide, under a clear span barrel vault that rises 130 feet above the floor, acclaimed as "the largest enclosed clear span space in the world". Any preservation treatments would involve considerable investments, and a scale of operations and techniques not usually associated with the "interior" restoration of one space." Historically, lighting had been provided by an innovative system that made use of the 196,000 square feet of acoustical tile clad ceiling as a reflector, creating dazzling light displays. This highlighted an impressive array of architectural finishes and colors and a dramatic proscenium and stage curtain assembly standing several stories high. Unfortunately, during the Depression, this was replaced by pendant light schemes that punched through the ceiling tiles. Gradually the architectural beauty of the building was concealed by the glare of harsh overhead lights, layers of inappropriate paints, and a severely damaged, grime-covered and water-stained ceiling. The damaged asbestos-contaminated ceiling was replaced with a perforated metal ceiling reproducing the articulation of the original tiles. This allowed the recreation of elaborate lighting effects on the reflective ceiling. The balconies were replaced by a stand-alone seating bowl, distinct from the original fabric, meeting current life-safety and barrier-free access code requirements, with a musicians' balcony providing a "scenic overlook" from which to view the immense space, a distinctive feature of the original configuration. New seats were installed and a number of the old were restored for display. Restorative treatments recreated the rich color palette of the original decorative scheme. The $100 million rehabilitation - to transform this obsolete building into a modern sports and entertainment center - qualified for historic investment tax credits. Succinctly summarized by Sharon Park, architect for the National Park Service, "thanks to this excellent rehabilitation, its literal place along the boardwalk is assured for many years to come". 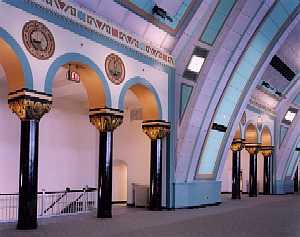 When Atlantic City Convention Hall was built, the city fathers who placed the state seals around the Hall, had a grand vision of a National attraction. With this project, that vision has been renewed. What more can one say about a building that has an internally lighted stained glass globe above the stage with the letters "WPG" - for World's Play Ground"? 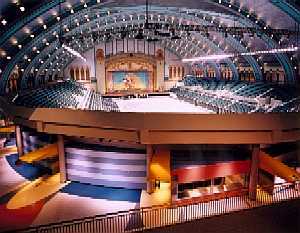 Thanks to this project, Atlantic City's Convention hall is once again a splendid palace for the spectacular. Historic Boardwalk Hall, LLC, Owner; New Jersey Sports and Exposition Authority; Ewing Cole Cherry Brott, Prime Architect/Engineer; Watson & Henry Associates, Historic Preservation Architect/Engineer; Rosser International, Sports Consultant, Tishman Construction Corporation, Construction Manager; Evergreene Paint Studios, Inc., Historic Preservation Contractor. More than 150 years following the first campaign to save George Washington's Mount Vernon plantation, the bulk of historic preservation is still being undertaken by volunteers. The community effort to protect the Black Creek Archaeological site was achieved through the efforts of non-paid professionals and local advocates. The Black Creek Native American site was identified in the early 90's by a bridge replacement project along Maple Grange Road in Vernon Township. For almost a decade, field archaeologist Rick Patterson had been meticulously surface collecting and plotting the locations of hundreds of artifacts that would surface each year after plowing in the north and south fields of this 40 acre site. 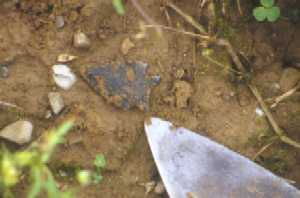 The artifacts confirmed that the site was in recurrent use for the last ten thousand years. It is also some of the last land occupied by the Lenape before their expulsion from New Jersey. The award nomination for this effort was made by Mr. Everett Paladini, who related how his "wife (Jessica) worked day and night for more than one year to inform and educate people about the Black Creek Site. She wrote hundreds of letters, made thousands of local and out-of-state phone calls at our own expense, and spent thousands of hours putting together seminars, social gatherings, information sessions, and cultural events to reach as many people in the community, state, and country that she could, informing them of the importance of the Black Creek Site. She persevered and never lost hope that one day the site would be listed. That day finally arrived on April 1, 2002." The site was nominated for listing on the New Jersey and National Registers in 2001. Opposition to listing this site on the Registers came from township officials who had acquired this 40 acres as part of a larger 182-acre parcel. The land was purchased by the township with an intent to create a recreational complex. Construction of the complex would have destroyed a good portion of the site and with it, the history that we value and learn from. The Lenni Lenape were enlisted to try and stop the desecration of the site. On the morning when all parties were to appear in court, township bulldozers were dispatched to clear the site. Alerted to the attempt to disturb the site, a Superior Court judge placed an injunction against physical harm on the site. This order allowed the nomination to go forward through the state's designation process. Thanks to the relentless persistence of a group of local advocates, the preservation community has a new constituent group - the Lenni-Lenape Indians of New Jersey. Prior to Black Creek, little was known about this community; they had been virtually silent as spokesmen for their ancestral past.. This preservation effort has provided a new dimension to how we, as cultural resource experts, evaluate pre-historic archaeological sites. Through this process we witnessed a collision between the traditional culture of the Lenape and the archaeological science that here-to-for would have been enough to resolve a land use conflict. Certainly this effort has given us some new consideration for what might - in the future - be considered appropriate treatment. The Lenni-Lenape Indians of New Jersey for their commitment to preserve our collective human heritage and their contributions to NJ's better understanding of the history of its indigenous peoples, specifically to Urie Ridgeway, Earl Evans and Tribal Chief Mark Gould. Jessica Paladini, for her tireless commitment to bringing an ethic of historic preservation to her community. Rick Patterson, for his ten-year commitment to this site, his due diligence in seeing it protected and for this enthusiasm in never getting tired of telling us about it. Matt Brown of the Bergen Record and Barbara Maneri of the Vernon News-Advertiser North for their extensive and balanced coverage that has brought public attention to the preservation process. Every so often, someone surfaces who's contributions to the advancement of historic preservation and the preservation of historic sites in New Jersey, is so deserving of recognition that an award is given to one individual. This year, that person is Gregory A. Marshall. Mr. Marshall served the State of New Jersey in his capacity as the Director of the Division of Parks & Forestry for 18 years. As the State Park Service grew in acreage, so too did the number of historic sites it managed, but more importantly, began to interpret as such. At last count, the Division owns and oversees 57 historic sites. And under Mr. Marshall's leadership, the sites continued to be upgraded, and more staff for interpretation and visitor services were hired. Under his leadership, many of New Jersey's historic sites were restored, receiving accolades from the preservation community and with some initiatives even receiving State and national recognition as well. As many have attested, Mr. Marshall was well known for his participation in the many Friends Group organizations, attending board meetings, committee meetings, public events, and visiting with staff, at any time of day, week or evening. He was truly interested, attentively listening and providing encouragement for the not so easy to overcome obstacles. One of the key projects in which he took a leadership role was highlighting the role of New Jersey in the American Revolution. Under Mr. Marshall's direction, the Division of Parks and Forestry, the first organization to focus on the Revolution as the 225th anniversary approached, developed a marketing campaign called the Crossroads of the American Revolution, producing a guide to American Revolutionary War sites, a driving tour brochure, a poster and a lecture series. This initiative gave way to the 225th Anniversary Celebration Commission and became the catalyst for the Crossroads National Heritage Area study. Greg Marshall would be the first to point out that these achievements were due to the dedication and focused efforts of the many others involved in these endeavors. However, it was Greg who demonstrated the vision coupled with the ability to strategize, to set goals and accomplish them despite insufficient resources in funding and staffing and in spite of the challenges posed by bureaucracy. The historic preservation award for "Significant contributions to the advancement of historic preservation and preservation of historic resources in New Jersey" was presented to Mr. Gregory A. Marshall.